Crazy Egg is free to try and super cheap after that (it can cost as little as $9 per month). Famous for its heatmap (see image below), Crazy Egg claims also to track eye movement. It quotes a Carnegie Mellon professor who says the correlation between mouse movement and eye movement is 88%. 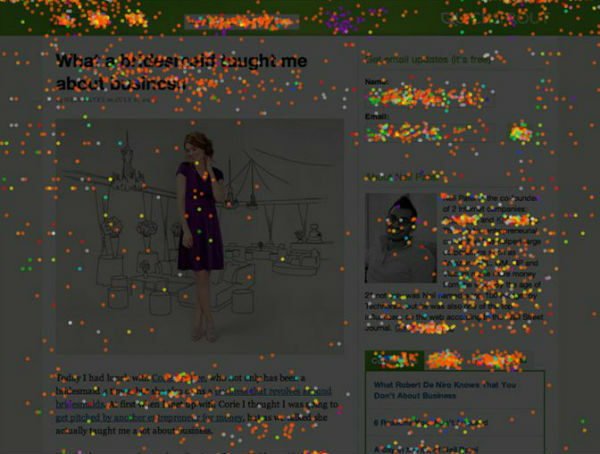 It also offers a scrollmap and a confetti report, which displays every click on your page. This is a great help in fixing user interface problems. Crazy Egg is a hosted service like Google Analytics. Piwik is an open-source alternative to Google Analytics with a very important difference: It’s software. You download and put it on a server and run it as you would any other application. Some folks yearning for “net zero cost” alternatives may find this off-putting because servers are not free. A geeky cousin of Piwik, FireStats is also software. It’s especially well-suited for WordPress and can be installed as a plug-in. Its chief feature (self-proclaimed) is that it protects the privacy of your users (unlike Google Analytics, as FireStats is wont to point out). This may seem trivial, but with “do not track” dogging the tracks of trackers everywhere, we may at some point be headed back to servers and real first-party cookies (rather than the spoofed first-party cookies served by certain hosted analytics solutions). While “hits” has become a dirty word for savvy marketers, be aware that FireStats creates a raw log of hits for those who want to analyze every server request. Of course it can deliver referring information, search engine keyword information and page popularity reports. However, given its hacker-heaven vibe, it’s probably not for the beginner. Free to try and free for non-commercial use, Woopra is also cheap if you need volume. It’s a hosted solution and offers robust visitor profiles and visitor history in a neat-looking dashboard. A Custom Events feature lets you track tough-to-spot actions like game interactions, videos played and ad click-through rates. A desired feature on even high-cost solutions, notifications about selected activity on your site are available via Woopra. For instance, you may want to be notified about a 404 error or a sign-up, and the tool will send you an email. Woopra is visitor-centric and prides itself on enabling personalization by utilizing analytics: It goes beyond where even some paid analytics tools go in this department. Taking user-centricity a step further, it lets you provide customer assistance on the spot via live chat. And since it’s hosted, startup is point-and-click. Looking for good-old log-file analysis software? Then AWStats is in your future. Naturally it needs to sit on a server to analyze log files, but it’s one of the only analytics tools that does so at all. It reports on web logs, FTP logs and email logs. It reports on geographical stats including city, country, ISP, organization and state — all of which makes sense because those parameters are embedded in most server requests. It will track unique visitors, returning visitors, time on site and page views. But it won’t track mobile or Flash files. Where Piwik uses PHP language, AWStats uses Perl. And, since it tracks log files, it also tracks robots and spiders. Many users say they miss this in their tag-based reporting, but it’s always there in the log file no matter what — and AWStats can get it. Despite consolidation in the high-end market for analytics, there remains no small number of free or almost-free entrants in the field that have, for one reason or another, never caught on. And because some of them are open source, they tend to appeal to those types who boot with Ubuntu rather than Windows or Mac (including a small amount of marketers). Beyond their no-cost or low-cost appeal, they do offer features that make them at least worthy of checking out, as shown above. But perhaps the biggest reason is that you can, with any of the tools above, either pay little or nothing for a hosted service and not have Google own your data.